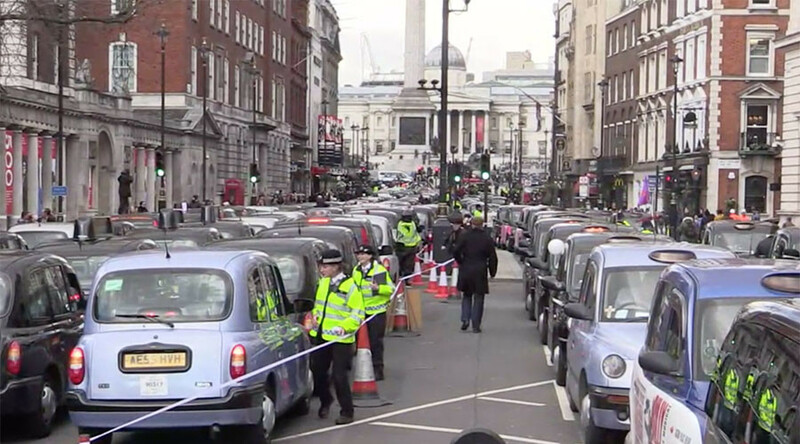 London’s famous black cab drivers took part in a major protest against Uber and other private hire vehicles by causing traffic chaos in the city center. Some 8,000 taxi drivers were expected to take part in the demonstration outside Parliament at 14:10 GMT, causing severe disruption in one of London’s busiest areas. Taxi drivers – colloquially known as ‘cabbies’ – are protesting against government body Transport for London (TfL) for its perceived failure to rein in private hire vehicles (PHVs) such as Uber. United Cabbies Group claim TfL’s latest proposals regarding future legislation for PHVs is not “pursuing a policy of public safety” because it is not carrying out sufficient checks on PHV drivers. TfL also controversially back-tracked on its plans to introduce a five-minute ruling, which would force Uber drivers who have received a booking to wait five minutes before picking the passenger up. RMT union chairman Mick Bailey told LBC Radio that Parliament had to take action to protest London taxis. “I hope that drivers that weren’t intending to come will get behind it and come down and show their support for their job,” he said. “Because if they don’t, we’re on the rocky road to nowhere. It’s your livelihood. It’s your job.